Most Scottish tourist literature tends not to mention small little things like ticks and midges but we want you to enjoy your time at Suisgill, and hopefully come back year after year, so we thought we would take this opportunity to give you some insight into what to expect and how you might deal with the darling little creatures while you are here. The Highland Midge, or Culicoides Impunctatus, is a small biting insect found more in the north and west of Scotland, than in the south or east. The midge population can vary considerably from year to year, depending on the severity of the preceding winter and the weather conditions during their breeding season; a wet summer, for example, will help their breeding cycle and result in an increase in numbers. 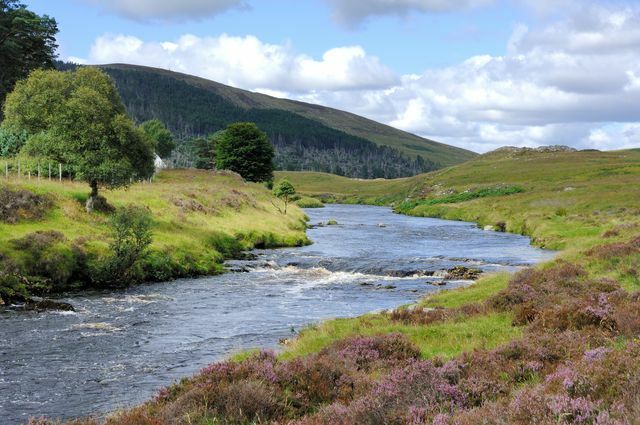 If you are planning your trip to Scotland between October and May, you will be pleased to know that you are unlikely to encounter any midges while you are here and that they only really become a problem in the summer months of June, July and August, diminishing rapidly in September and disappearing completely after the first decent frost. During the summer months, the simplest thing to do is avoid them and, no, that does not mean you need to lock yourself inside all day, just follow our advice below and you should be fine. – Midges are at their worst in the early mornings and late evenings so these are the times to avoid being outside if you can. – Midges like cool, damp and still conditions and hate direct, strong sunlight and anything more than a gentle breeze. Therefore, if sitting outside, try to find a spot where there is some breeze and, if conditions allow, sit in the sunshine rather than the shade. – Midges can’t keep up with a normal walking space so, if you are out and about walking or doing something else active, you won’t be bothered by them until you stop. – Try not to wear dark clothing (for some reasons midges prefer dark coloured clothing to light) and try to wear long-sleeved shirts and trousers. – Always take some kind of midge repellent or protection when you go out; it may not be midgey when you set off, but they can come out very quickly if the wind drops. – Don’t leave window or doors open at night with the lights on…people tend to only make this mistake once! There are a number of midge repellents available on the market, with Jungle Formula and Smidge being popular choices. Bizarrely, however, it is a moisturising product from Avon called Skin So Soft Dry Body Oil that has been proving to be the real hit in recent years. That it has midge-repelling qualities seems to be a happy accident, as it is not its intended purpose, but ask any fisherman on the River Helmsdale and they swear by it! Sometimes though, you will find yourself in situations* where midge repellents really don’t cut the mustard and, if you want to carry on with your activity undisturbed by midges, then you really need to be wearing some form of midge net. There are lots of different types on the market, but normally a midge head net such as this will do. If you do get bitten, it is difficult to say how you will react as everyone seems to have different reactions to midge bites. Some people will just get a tiny red dot that doesn’t irritate them at all, and others will come up in itchy red lumps. If you do react badly, Piriton allergy tablets can help, as can over-the-counter creams for insect bites, but the real trick is to try not to scratch them…the more you scratch them, the itchier they get! Ticks are tiny blood-sucking parasites that are found in some parts of Scotland. They tend to inhabit moist, coarse, permanent vegetation in moorland and woodland – amongst the bracken is a particular hot spot – where they wait for an unsuspecting passer-by to brush past so they can jump aboard. Ticks are most commonly found on dogs rather than humans, but if you spend any time crawling around in bracken or heather (stalking for example), or cuddling your dog who has been charging about in the undergrowth, then you may find that you pick up one or two yourself. Generally this is nothing to worry about but ticks have been responsible for transmitting Lyme’s disease in humans so it is worth highlighting that, if you notice a tick and then find you start to develop flu-like symptoms, you should always consult your doctor immediately. At the end of any day out and about in bracken, heather or similar, you should always check yourself, your children and your dogs for ticks. Initially, they just look like a black speck of dirt (albeit with tiny legs) and can be hard to miss. However, as they start to feed they fill up and can grow to the size of a pea. If you do find one, you should remove it at the earliest opportunity to minimise the risk of Lyme’s Disease. To do this, you need to grip the body (tweezers work well for this), gently twist and pull the tick out, taking care not to leave the head in as it might turn septic. Dog owners may find that they need to remove a number of ticks a day and there are special products on the market to help you do this – click here for more information. We would also advise any dog owners coming to the Highlands with your dogs to treat them with Frontline before you come. Just a couple of drops on the back of your dog’s neck and they will taste nasty enough to keep them tick free for up to a month.